Always quick, efficient, and there when you need it, cereal has long been a breakfast staple. Is it healthy, though? Recently, news broke that several popular cereals—including Cheerios, Lucky Charms, and Quaker Oats—contain traces of the weed-killing chemical Roundup (albeit at very low levels). Perhaps even more insidious, though, are the high levels of sugar found in many popular cereals. If you're looking to start your day off with a helping of healthy cereal rather than spoonfuls of sugar, a few nutritionists who spoke with the Huffington Post offered tips on what to look for on the box. One thing you can do is check the ingredients on the back of the box and look for cereals that list a whole grain first, such as whole-grain oats or wheat, corn, buckwheat, or rice. Refined grains, on the other hand, have less fiber and vitamins. As a result, they’re digested more quickly and may leave you feeling hangry by the time 11 a.m. rolls around. Studies have shown that consuming more whole grains may also help reduce your risk of early death. Next on the list of factors to consider is the sugar content. Look for a cereal that has less than six grams of sugar per serving—but under four grams is preferred. Ideally, you’ll also want a cereal that has at least three grams of fiber and five grams of protein per serving. “Protein and fiber help keep you fuller for longer, and we should try and limit our intake of added sugar,” dietitian and nutritionist Amy Gorin tells HuffPost. This may seem obvious when it comes to kids’ cereals like Froot Loops and Cocoa Puffs, but even adult cereals may seem healthier than they really are. Quaker Oats Oh!s, for instance, boast “0 grams trans fat” on the box, but they’re 44.4 percent sugar, according to CBS News. Several varieties of Kashi, Nature’s Path, and Barbara’s Puffins cereal come recommended, and Cheerios generally aren’t a bad option, minus the recent Roundup scandal. 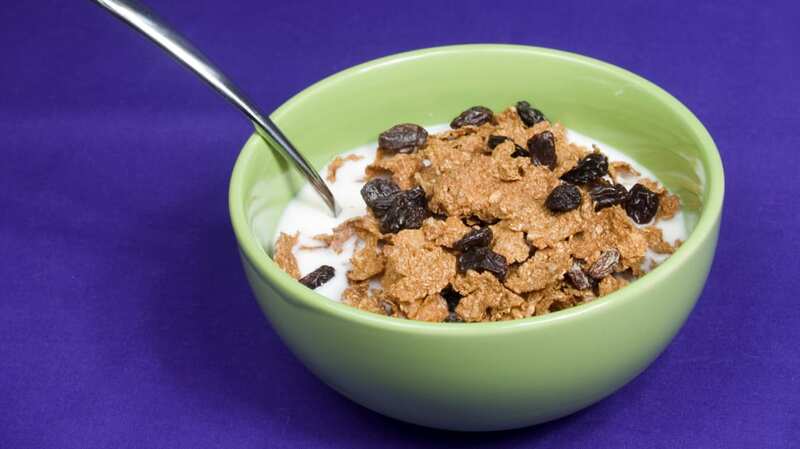 If you’re at a hotel breakfast buffet and have limited options, look for Raisin Bran. The Kellogg’s cereal is high in sugar (18 grams), but much of it comes from the raisins rather than added table sugar. It’s also high in fiber (7 grams) and meets the criteria for whole grains and protein. If you can’t live without your Honey Smacks, though, just remember: Everything in moderation.